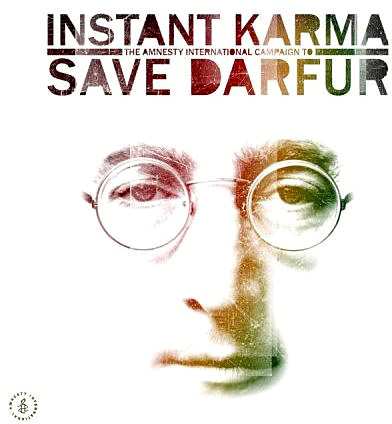 i’v been listening to the instant karma cds (part of amnesty intl’s campaign to save darfur) for a while now and i have fallen in love with john lennon, all over again. first of all kudos to the artists who participated in this project and produced some amazing music. i have to single out those who captured the spirit of the songs but also made them their own. to take songs that are as well-known, as well-loved and as meaningful to so many and be able to imbue them with one’s own brand of fire, one’s own musical vibe without compromising anything is huge. U2’s “instant karma” is first on my list along with green day’s “working class hero”. the following are some of my other favorite john lennon song renditions: christina aguilera’s “mother” (she was perfect for this song – that ache in her voice), jake dylan and dhani harrison’s “gimme some truth” (brings back to life the passion of john lennon the activist), jackson browne’s “oh my love” (exquisite, tender, beautiful), youssou n’dour’s charming “jealous guy”, snow patrol’s “isolation” (haunting, very cool), regina spector’s excellent rendition of “real love”. this is truly a terrific assemblage of great songs performed by some very strong and stylistically diverse artists. you can now get the album for $16.99 from mtv.com. go for it! Green day’s ‘working class hero’ is so real so true.It makes you sad at heart. John Lennon was no doubt unique as a person.